The Expected R2 Indicator Improvement is a new infill criterion for surrogate assisted multiobjective optimization. Different implementations of it are provided. The Monte Carlo implementation is used in the paper submitted to EMO 2018. The Matlab and Mathematica implementations of an exact formulation are still in a beta stage. Questions about the code can be asked to André Deutz (a.h.deutz at liacs.leidenuniv.nl). Implementation of the Diversity-Indicator-based MOEA (DI-MOEA) by Yali Wang, Michael Emmerich, and Andre Deutz in the MOEA-FRAMEWORK (Java). The code was implemented by Yali Wang. A Pareto front of building spatial designs computed with the BSD toolbox from the STW Project "Excellent Buildings by Forefront Multidisciplinary Optimization. (For the respoducibility of results in the paper submitted to EMO 2019, Ann Arbor, US). (1) Emmerich, Michael, et al. "A multicriteria generalization of bayesian global optimization." In: Advances in Stochastic and Deterministic Global Optimization. Springer International Publishing, 2016. 229-242. (2) Yang, K., Emmerich, M., Deutz, A., & Fonseca, C. M. (2017, March). Computing 3-D Expected Hypervolume Improvement and Related Integrals in Asymptotically Optimal Time. 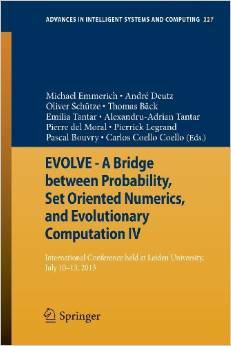 In International Conference on Evolutionary Multi-Criterion Optimization (pp. 685-700). Springer, Cham. Programmed and (c) by Kaifeng Yang and Michael Emmerich. The file MOEAFramework-2.11-Longmei.zip contains Target Region Based Preference Modelling MOEAs implemented in the MOEA Framework. It is based on the paper: Wang, Yali, Li, Longmei, Yang, Kaifeng, & Emmerich, Michael T. M. (2017, June). A new approach to target region based multiobjective evolutionary algorithms. In Evolutionary Computation (CEC), 2017 IEEE Congress on (pp. 1757-1764). IEEE. The file Superspheres.zip contains MATLAB implementations of test problems GSP, 3-D Superspheres, and Mirrored 3-D Superspheres based on Emmerich, M. and Deutz, A.: Test Problems based on Lamé Superspheres (2007), In. : S. Obayashi et al. (Ed. ): Int'l. Conferences on Evolutionary Multi-criterion Optimization 2007, Matsushima, JP, Springer, (pp. 922-936). IRSfast: Fast Expected Hypervolume Improvement Calculation. The file MACSDVRP2013.zip includes the code and benchmark used for the generation of the experimental data of the paper submitted to IWINAC 2013 on an algorithm for solving DVRPTW. The zip-file ELSA_code.zip contains MATLAB code for Evolutionary Level Set Approximation. The ELSA algorithm is designed to find good approximation sets of (sub)level sets for real-parameter optimization problems. The zip-file contains a collection of MATLAB scripts, amongst which the main ELSA algorithms, implementations of different quality indicators, and the starfish superformula. This page serves as a suplement to the paper: "Getting Lost or Getting Trapped: On the Effect of Moves to Incomparable Points in Multiobjective Hillclimbing". Here, a zip-file EMO-MARKOV-TOOL.zip is provided that contains the MATLAB code for the Markov chain analysis. The zip-file HV_based_expected_improvement.zip contains MATLAB code for the computation of the Hypervolume Based Expected Improvement. M. Emmerich and C. M. Fonseca, “Computing hypervolume contributions in low dimensions: Asymptotically optimal algorithm and complexity results,” in Evolutionary Multi-Criterion Optimization. Sixth International Conference, EMO 2011 (R. H. C. Takahashi et al., eds. ), vol. 6576 of Lecture Notes in Computer Science, pp. 121-135, Berlin: Springer, 2011. Find a detailed description in the included README.txt. The file Kriging_Metamodeling_for_Finding_Robust_Optima.zip includes the code used for the generation of the experimental data of the paper: A Robust Optimization Approach using Kriging Metamodels for Robustness Approximation in the CMA-ES (CEC 2010). The original code of the CMA-ES can be found at: http://www.lri.fr/~hansen/cmaesintro.html. VMO is a software tool for the visualization of multiobjective optimization data. This software tool is developed by W. Wu and has proven to be a very useful tool for the visualization of Pareto fronts multiobjective optimization. It can be downloaded as a zip-file: VMO_v1.0.zip. To install it, just unzip it and run the executable. A small user manual is included in the zip-file. On request, we can also provide a linux release (e-mail: Michael Emmerich, emmerich-at-liacs-dot-nl). The file WDN_distributable_2011-10-05_1154h.tar.gz implements Multiobjective Evolutionary Algorithms (NSGA-II, SMS-EMOA), coupled to the EPANET water networks simulator, to be used for the optimization of water distribution networks (input files for test problems Two Loop, Hanoi, and New York City).